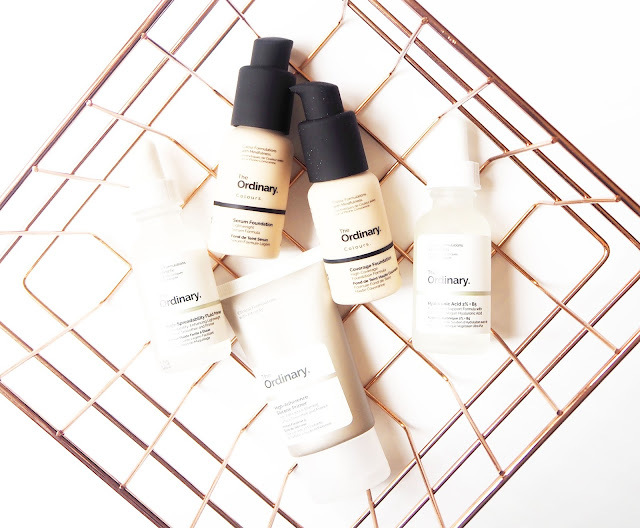 I'm sure by now you have all seen and heard about The Ordinary, a skincare brand that seems to be having a bit of a moment. There has been so much hype surrounding this brand that I just knew I needed to try out a few things for myself, any excuse hey? I picked up one skincare item, two primers and two foundations in my little haul and have been giving them all a go for a fair few weeks now so feel like I'm at the point where I can share my honest opinion on them. I just want to say that all of these products are very reasonably priced and they come in simple but chic packaging. Don't get me wrong, I love fancy packaging but sometimes its nice to have a brand that focuses more on keeping the cost down and packaging simple but still with a high quality product. As I'm approaching my late twenties I am noticing that certain areas of my skin are starting to become a lot drier which is a bit of a 'mare as some bits are still fairly oily, a challenging combo to say the least! I drink tonnes of water to keep hydrated but felt my skin just needed something a little more so decided to give the Hyaluronic Acid 2% + B5 (£5.90) a whirl. Hylauronic Acid is known for its hydration qualities so I had high hopes and it hasn't let me down. I've been applying two or three drops in the evening after I've cleansed and in the morning before I moisturise and have definitely noticed a difference to the dry parts on my face and an improvement on the texture, its much smoother now. There are two primers in the range so I got both to give a go. First up is the High-Adherence Silicone Primer (£3.90) and I'll be the first to admit I don't usually like silicone primers, its just something about the texture I really dislike. However this one doesn't have the typical silicone-like feel to it, it feels much more like a cream which is ideal for me. This creates a nice, hydrating, moisturised base for applying your make up to and I have enjoyed using it. Longevity wise I'm not sure it prolongs make up as such but like I said, it preps your skin well and helps to diminish the appearance of pores. The second primer in the range is the High-Spreadability Fluid Primer (£5.50) and this comes in the same packaging as the Hyaluronic Acid with a dropper, I can't recall ever seeing a primer in a bottle like that before! The purpose of this primer is to prep the skin so that your foundation, concealer etc is easier 'spread' across the skin. Its quite unusual in the sense that the consistency is quite runny, on the website they describe it as a serum which I would say it a pretty good description, its definitely on the runny side. Of the two primers I liked this the best as I found make up applied to it easily and smoothly. Lets get into the foundations... I picked up both formulas in the shade 1.0N which is the fairest shade they do with a neutral undertone. From the swatch on the website the pink undertones looked a little too pink for my skin which is why I opted for the neutral shade and I have to say its a near perfect match for me. The Coverage Foundation (£5.90) gives you just that- coverage. I found that one layer of this foundation is more than enough to cover up the majority of blemishes and dark circles but it is buildable if you want even more coverage. It dries down to a matte finish and when its first applied I love how it looks on my skin. My issue with this foundation is that it just doesn't last on my skin, within a couple of hours it breaks up on my chin and all around my nose leaving my skin looking very oily and messy. I tried this out several times with numerous primers and it happened each time which is disappointing as like I said, I love it when first applied. The Serum Foundation (£5.70) has a much more liquid like consistency than the coverage foundation, which the name suggests. I found one pump of this was the perfect amount for my whole face. This is definitely a light coverage foundation but can be built up for a more medium coverage with a bit more work. I liked this because it gave a very natural looking finish to my skin, not too glowy, not too matte just 'skin' like. It was a dream to blend out and personally I don't think I would wear this on days when I had a 'full face' on but for 'no make up' days its perfect. Overall I think The Ordinary are a brand that are getting it right majority of the time, low cost, high quality products are what people want and they're delivering. Let me know what you like from them as I'm keen to try out some other bits!